Check for Asbestos, Lead and Mold in your home all from one easy to use combo kit. This kit comes complete with all collection media to test for 1 asbestos sample, 1 mold sample and 1 lead sample (paint chips, soil or, dust wipe). Analysis Fee is included in the price. NO hidden fees. Professional, accurate, and certified analytical results are available to view online within 5 business days of receipt of your kit. This combo testing kit is what you need to ensure your personal environments are not contaminated with three of the most common environmental hazards. 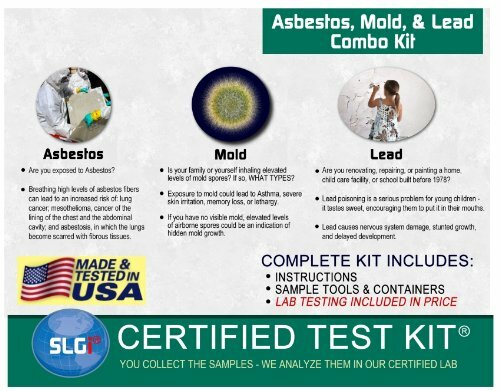 This test kit is for the analysis of one mold sample, one asbestos sample, and one lead sample. The price of this kit includes all lab fees, sample shipping costs, and sampling material(s). We offer a complete line of other SLGI Certified Test Kits and screen tests; check 'em out! Manufacturer: Schneider Laboratories Global, Inc. Publisher: Schneider Laboratories Global, Inc. Studio: Schneider Laboratories Global, Inc. If you have any questions about this product by SLGI Certified Test Kits, contact us by completing and submitting the form below. If you are looking for a specif part number, please include it with your message.